Walk Your Pet To Fitness! Now is as good a time as any to continue a fit lifestyle – for ourselves as well as our pets. We understand that keeping fit is not just about loosing weight- it is about living a healthy, active lifestyle that includes a balanced, nutritious diet and the right amount of exercise. Overweight pets often experience a reduced quality of life, as they are less able to enjoy exercise or interact with the family- pets become lethargic and sleep more. These animals are also at an increased risk for many clinical problems including heart disease, arthritis, respiratory problems and diabetes. A successful weight loss program may involve a lifestyle change for both you and your pet. This may seem a little daunting but a member of the health care team will help you with any advice and will be your point of contact for further information and support. Together you will plan a weight loss program that suites your pet- and you! Stick to the recommended daily allowance – it is useful to set out the amount at the beginning of the day to avoid accidental overfeeding. Divide the meals into several feedings to help promote more effective weight loss. Keep your pet in another room while you are preparing or eating your own meals. Do not leave any food lying around. Give clear and concise feeding instructions for pet sitters when you are away- have pre-made baggies of food measured to feed. Introduce any new food gradually over a 7-day period by mixing your pet’s former food while increasing proportions of the new food and less of the old food. Let your pet warm up and increase exercise gradually as fitness improves. Always follow the recommended exercise program – it has been set up with your pet’s needs in mind. Try exercising your pet with other pets (only if your pet is social). 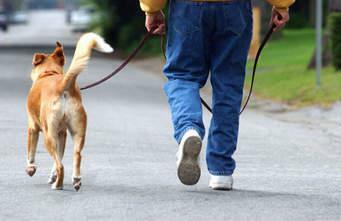 If you cannot exercise your pet, ask a family member, friend, neighbor, or a dog walker to do it for you. Fun and games- play games with your pet- they love interaction with thir owner- have a special toy as a reward. We all like to reward our pets and there is no reason why a pet on a weight loss program cannot receive them too! There are alternatives to food rewards. If possible, avoid food snacks! If your pet is used to receiving them, a limited amount of healthy snacks will not compromise their weight loss program. One should ideally use them occasionally to reward exercise or for achieving short-term weight targets. All family members should verbally commit to the program- the program is no use if someone continues to feed unhealthy snacks. Ensure that your friends and neighbors understand what you are trying to achieve. If you lapse every now and again- do not worry- it happens! Take a before photograph to remind you of how your pet looked before starting the program. Set small, short-termed goals- end results always seem easier if you break it down into “parts”. Come in for weekly weigh-ins!